I felt very privileged to witness that uniting taking place during those two days, in the many obvious good conversations, in sharing while eating (see the photo below) together and in talk in the not-so-formal sessions. A good example of this was the vigil for peace, which the farmers organized. This vigil went into the night with singing, praying, and preaching till past midnight. Another example was the teasing, joking, and laughing heartily and loudly at one am. Many of the participants were people who hardly knew each other before that day. These people were mostly in their 40`s or 50`s. The fact that this gathering was held without alcohol was another very good aspect of it, and this showed they were doing it from their heart. Six months ago there were two communities uniting; today there were five and they have the vision to gather three more into the group eventually. Three years ago, they were in many ways just individual families trying to farm in peace. CPT`s presence has had a major part in providing enough space so they could begin dialogue with each other. It seems that the armed groups want to keep them in disunity and living in fear so that the people are dependent on the armed groups. This uniting is breaking down the power of the fear that the armed groups have been promoting. I am very grateful for a Colombian Church organization that provided the funds and facilitated the gathering as a part of its peace work. One thing that was so good about the gathering was that farmers themselves were doing the sharing and giving the leadership. Things were not perfect but the unity was coming out of the grassroots, where true democracy has to come from. For instance, the Baptist pastor who was asked to lead a worship service invited leadership for half of it by one of the farmers who is illiterate but has a gift for singing, playing the harmonica, and composing songs. I just really sense the Spirit is moving and using this all to bring peace. (See the photo below.) It is not going to come overnight, but will build a firm foundation and create something solid for the long haul which will take time. These two days were part of the cornerstone in building that foundation. The Baptist pastor told me that my sharing my photos at the peace seminar last year had had a great deal of influence on him. He told me that he after hearing my presentation that he thought about how I had given up a luxurious life in North America to come try to help the people on the Opon, mosquitoes and all. He then decided to visit the people of the Opon with me for the first time. I was humbled that God had used my experiences and photos for good with this pastor. Thanks so much for your part in making this reality through the help of your prayers, concerns, and monies. 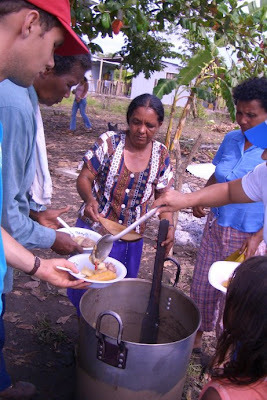 Here are some of the communities’ women serving everyone soup for the get- together. The conversations over meals built a lot of bridges between people during those days. Here is the Baptist pastor David in yellow leading a devotional time at this historic gathering. 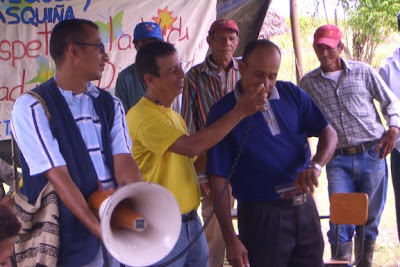 To the right of him is Otoniel singing with his harmonica in hand, and on the left is Alberto, a Catholic lay brother, holding the megaphone. It was good to see the churches cooperating in this way.